We know that Once Upon A Time has peculiar chestnuts it likes to go back to again and again. One of these favorites is the concept of “family,” which gets laid on pretty thickly tonight. Snow crows about family early on. Nemo and Killian and Liam lost theirs. Hook is trying to enter Emma’s, but Henry doesn’t want him too. 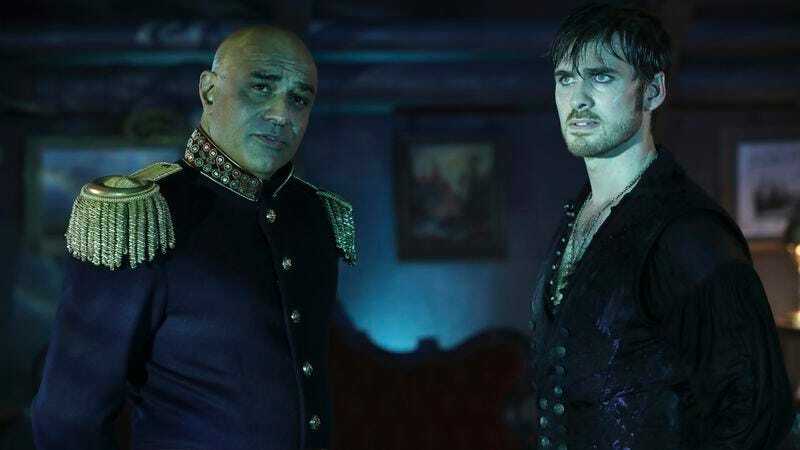 That said, the reveal of Hook’s lost brother Liam was a nice historical nod that was downright moving. I honestly had forgotten about that kid, and what could have happened to that baby after Killian killed his father. The main plot was so effective, however, that the other two plots this episode really seem like afterthoughts: Belle’s first ultrasound and whatever Aladdin was doing. Poor Snow has nothing better to do than to wait around the hospital for a guy she doesn’t know. If Captain Nemo died in years past, how is he alive in Storybrooke? I am undecided on Evil Queen and Rumpus (although any episode when he says “dearie” is a good one). On the one hand, with no one else to turn to, their prospective romance makes sense. On the other hand, ew. Giant octopus for the win.